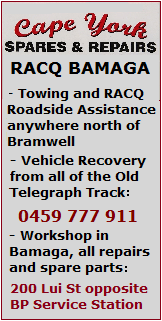 On this page you have the poisonous snakes that are found in Cape York. 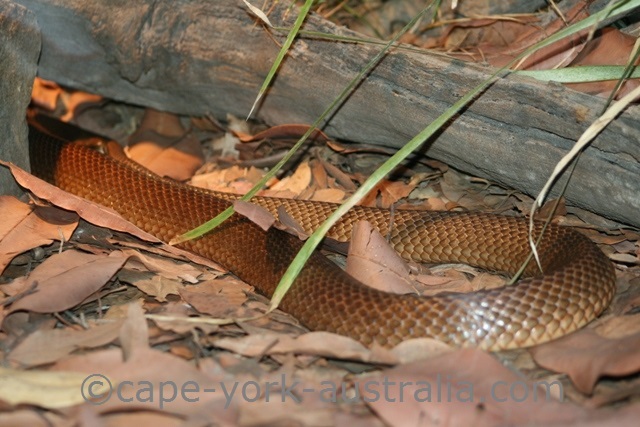 Some of the better known ones are coastal taipan, northern death adder, and eastern brown, western brown and king brown snake. Some of the less known ones, or the ones that are less common up here include red bellied black snake, eastern small eyed snake, rough scaled snake, myall snake, and a few others that are only known by their Latin names. If you are from overseas you are likely to be scared by this list but there is no reason to panic. You will most likely never see one on your Cape York trip, and even if you do, all you have to do is to leave it alone and it will go away. Australian poisonous snakes tend to mind their own business and not attack you unless you give them a reason. There are two species of taipans in Australia. 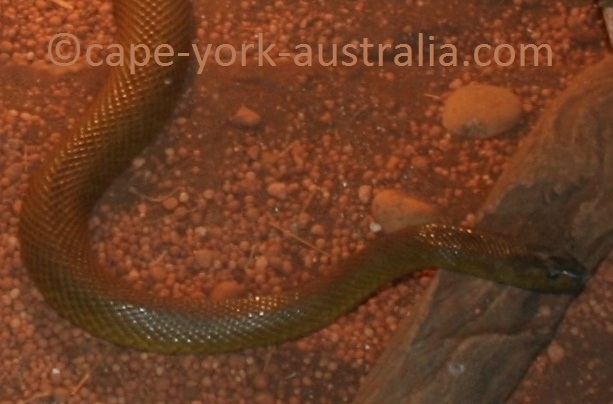 The inland taipan, aka fierce snake, is the most poisonous snake in the world, but it is found in south western Queensland and not in Cape York. 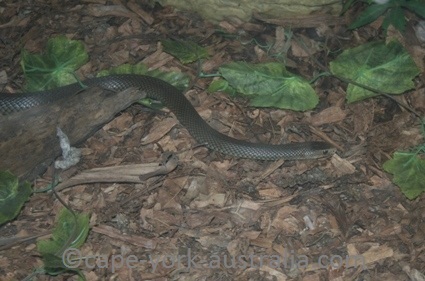 What a combination - the most poisonous snake in the world is so shy it doesn't want to bite even when provoked - I had to throw in a photo of the Inland Taipan even though it's not found here. 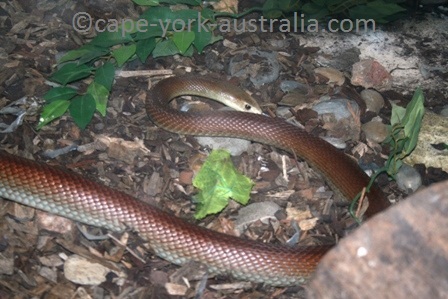 In Cape York, we have the coastal taipan, which is less poisonous, but not shy! It will flee unless cornered, but if cornered or threatened, it will defend itself aggressively and it can deliver multiple and quick bites. 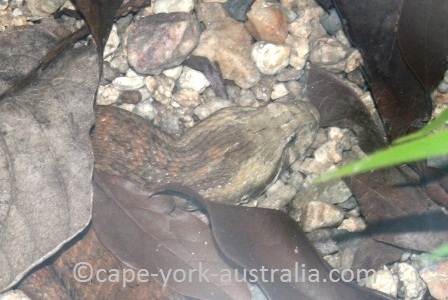 It is found in most of the peninsula, except the south west. It is most often about 2m long, but can be 3m and longer. It lives in open woodlands as well as rainforests and sugar cane fields. It likes to shelter in tree hollows and burrows abandoned by other animals. It eats small animals such as rats and bandicoots. These two poisonous snakes belong to the family of brown snakes. The eastern brown is found in most places in Victoria, New South Wales and Queensland, however in Cape York it only reaches up to the south eastern corner, until about Lakefield National Park north of Cooktown. It lives in agricultural regions and in the outskirts of cities and towns. 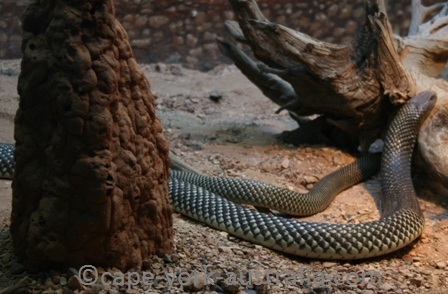 It is one of the most commonly spotted venomous snakes in the eastern Australia, and it is alert, quick and nervous. It is about 2m long. Western Brown is a bit shorter, about 1.5m long, and it is found in the whole Australia except the southern and eastern coast. 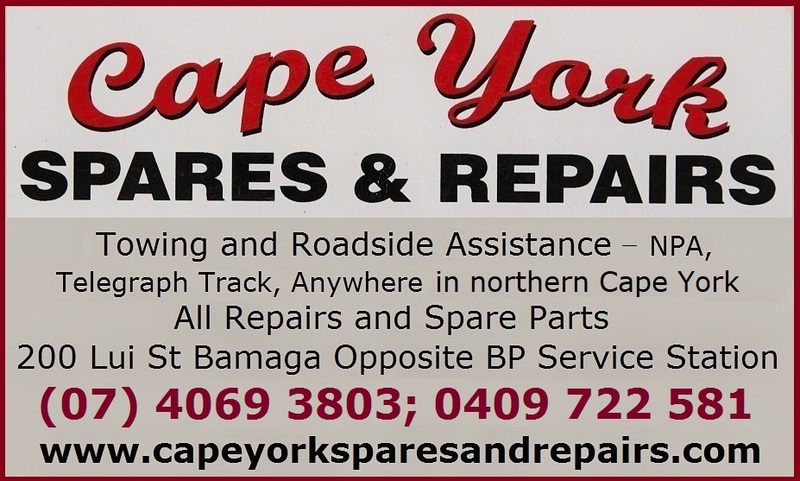 It is found on the whole Cape York peninsula. It likes dry habitats, such as woodlands and deserts. It eats small mammals and reptiles including other snakes. Like the eastern brown, it rears its head and forebody in an S-shape when threatened. King brown snake is one of the most common of our poisonous snakes, which, although called "brown", actually belongs to the family of black snakes. It is a large snake - more than 2m long, and it is found in the whole country except in the southern and south eastern areas. It is found in the whole Cape York peninsula, it likes dry habitats such as deserts and woodlands, and shelters in hollow logs and abandoned burrows. There are a few different species of death adders in Australia, Cape York only has the northern one, and it is only found in the northern and eastern parts of the peninsula. Like other death adders, it is a short (0.6m) and thick, robust looking snake, and it can be either grey or brown. It lives in woodlands, grasslands and rocky outcrops where it hides under leaves, with only the tip of the tail visible as a part of its hunting technique. It is a good reason to not to run around in dry leaves bare feet!